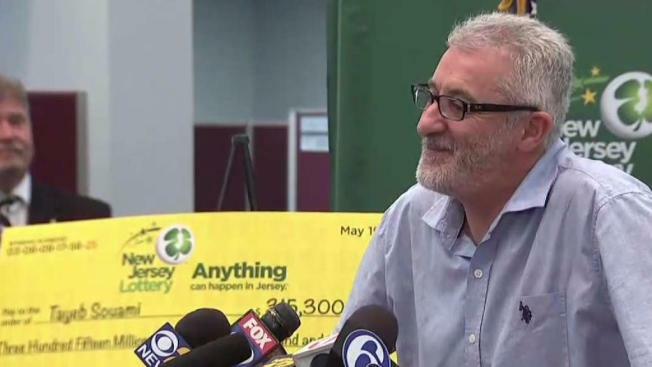 The winner of a Powerball jackpot worth $315 million has come forward in New Jersey. Lori Bordonaro reports. The winner of a Powerball jackpot worth $315 million has come forward in New Jersey. Tayeb Souami, from Little Ferry, accepted the money price of the May 19 drawing during a press conference Friday. “I’m very emotional right now,” Souami, who was accompanied by his son and financial advisor, said. During the press conference, Souami, 56, said he found out he was the winner the Sunday after the drawing when he was on his way to the car wash, but decided to stop at a local store to check his lottery tickets. When he checked the first ticket, he found out it was not a winning one. However, when he checked his second ticket, the scanner told him to see the retailer. He says he asked the store clerk to check his ticket and that’s when he found out he was the winner. “My heart started beating,” he said. That lucky ticket was bought on a whim while he was standing in line to return a $5 dollar bottle of orange juice because he said it wasn't on sale. The winning $315.3 million ticket is worth $183.2 million cash, officials said. Souami, who has a wife and two children, decided to take the lump cash option. While he only played the lottery occasionally, Souami, who refinanced his home in order to pay for his children’s college tuition a week before winning the lottery, says he already has plans for his massive winnings. Souami, who is originally from Africa, also plans on paying off his mortgage. Souami said he waited to come forward as the winner because of work responsibilities at a food importing company — a job he decided to quit after his big win. Lottery officials say the New Jersey resident holds the lone winning ticket of the May 19 drawing. It was sold at a ShopRite grocery store in Hackensack. 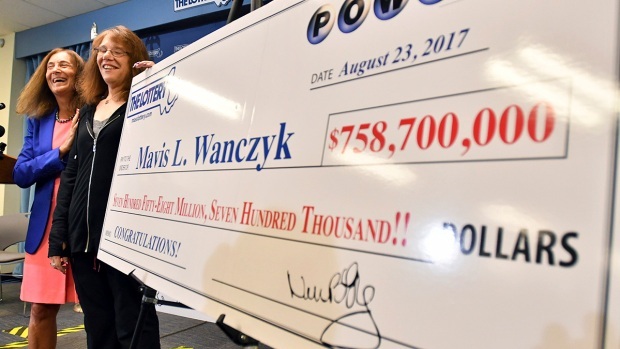 The ticket matched all five white balls and the Powerball to win the jackpot, which has a $183.2 million cash value. New Jersey Lottery officials presented Shoprite of Hackensack on May 21 with a $30,000 “Lucky Retailer” ceremonial bonus check for sell in the winning jackpot ticket. John M. White, the acting executive director of the New Jersey Lottery, was also on hand to present the bonus check to Lawrence Inserra, chairman and CEO of the Shoprite at Hackensack. On Friday, White said Inserra donated the money to charity. This marks the second major lottery win in New Jersey this year. In March, a Vernon man who was playing for only the second time in his life won a $533 million Mega Millions jackpot. He bought the ticket at a Lukoil station in Riverdale.